When I saw this one on Simon and Schuster's Galley Grab last month I knew I'd have to read it. 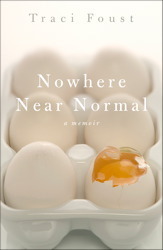 It's a memoir written by a woman who grew up with severe OCD. I was particularly interested in the religious facets of her OCD because I had some similar obsessions as a child. For example, if I knew someone was travelling and I thought of that person, I had to stop and pray for them for a sufficient amount of time in order to keep them from dying. If I didn't pray, and they died in a travel accident, I knew it would be my fault. Weird and irrational, but that's what I thought. The author has some similar obsessions, but to a much greater extent. In fact, her OCD is so uncontrollable that her family sends her to live in the family-owned nursing home for a period of time. The main focus of the book is on Faust's childhood, although we also get to see her grow up, mature, and learn to live with a devastating mental illness. I enjoyed the writing at the beginning of the book, but it got old quickly. It was very stream of consciousness with long run on sentences. It worked great when describing her childhood, but after a few hundred pages I was getting tired of it. I also felt like it was more suited to writing about childhood than it was to adulthood, which takes up a third or so of the book. I also felt like the book never reached a satisfying conclusion. When I read the last page, I wondered where the rest of the book was. The author's story seems to just stop in the middle. Definitely a good read. I was sucked in, I cared about the author, I cared about her family, I have no complaints other than that I didn't feel like the ending was right. It just seemed like there should be more to the story - although it may just be that the author hasn't lived the ending yet, since this is a memoir. I definitely connected with the author, and I found her stories interesting, though sad. I recommend to people who are interested in childhood mental illness or who have a special interest in memoir. It's not the best mental illness memoir I've read, but it's not the worst either. Thank you Simon and Schuster for making this available through Galley Grab! More to come tomorrow (I hope) on the Ringgold fundraiser - I'm still working on finalizing details.